Xenko supports most major video formats, but converts them to .mp4. To reduce compilation time, we recommend you use .mp4 files so Xenko doesn't have to convert them. Currently, Xenko doesn't support video on iOS platforms. 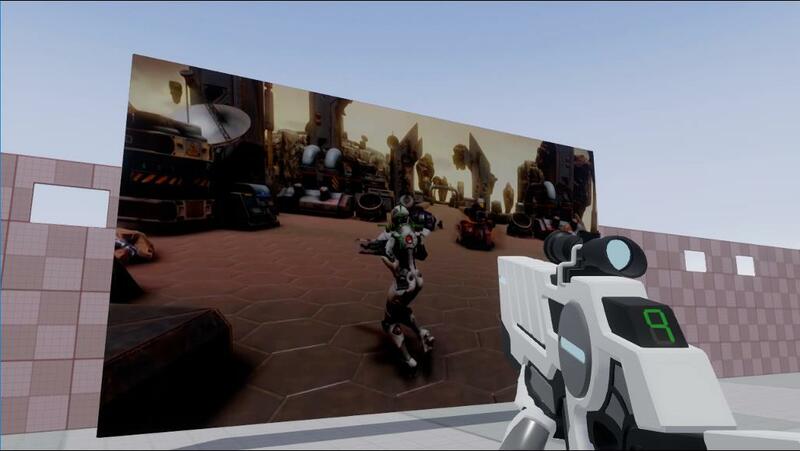 Before you can use a video in your game, you need to import it as an asset. 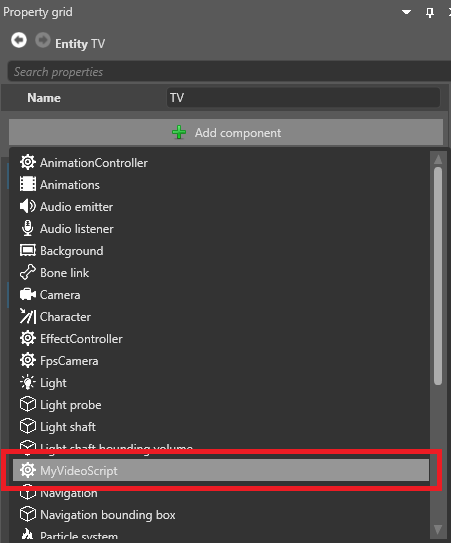 Drag the video file from Explorer into the Asset View. 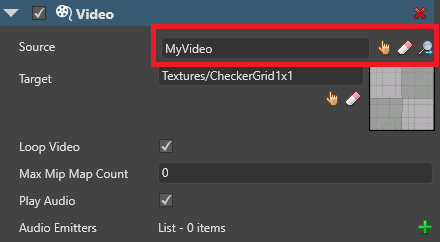 Alternatively, in the Asset View, click Add asset and select Media > Video, then browse to the video you want to add and click Open. 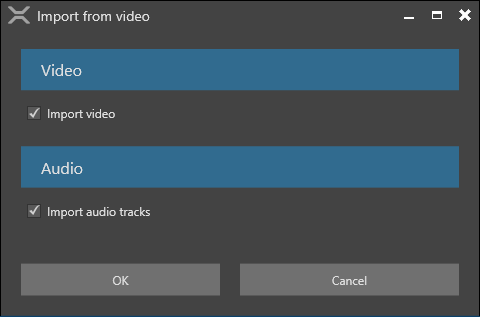 If the video has audio tracks, you can import these at the same time, or import just the audio from the video. Xenko adds the video as an asset in the Asset View. 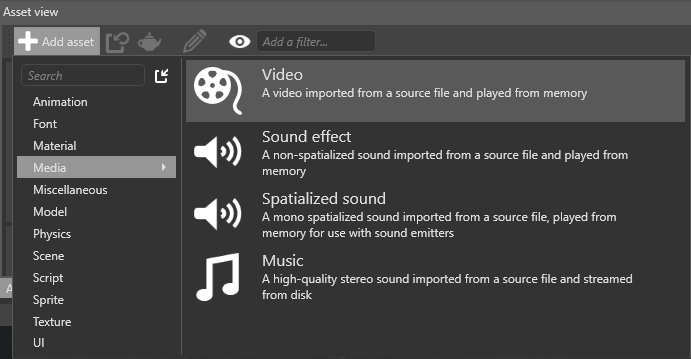 If you imported audio tracks from the video file, Xenko adds them as separate audio assets. Currently, you can't preview videos in the Asset Preview. For information about video asset properties, see Video properties. 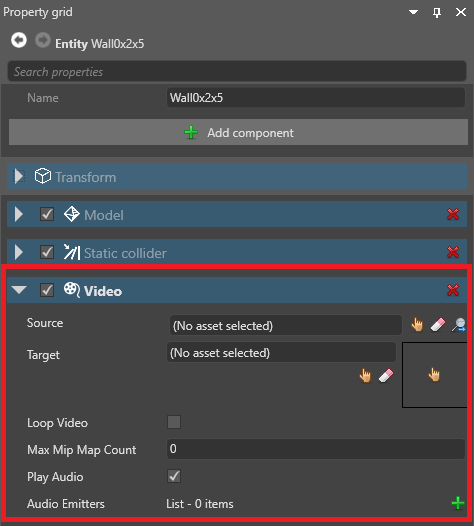 In the Scene Editor, select or create an entity to add a video component to. It's usually simplest to add the component to the same entity that has the texture plays the video. This just makes it easier to organize your scene. In the Property Grid, click Add component and select Video. Xenko adds a video component to the entity. In the Video properties, under Source, select the video asset. Under Target, select the texture you want to display the video from. Models that use this texture will display the video. When the video isn't playing in your scene, Xenko displays the texture instead. SpeedFactor: Set the video play speed. 1 is normal speed. // Initialization of the script. 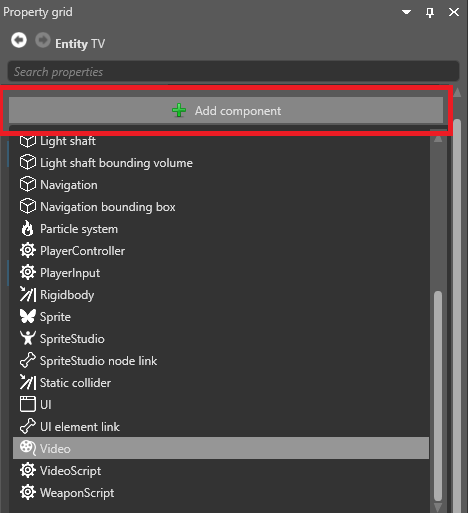 In the Scene Editor, select the entity that has the video component. 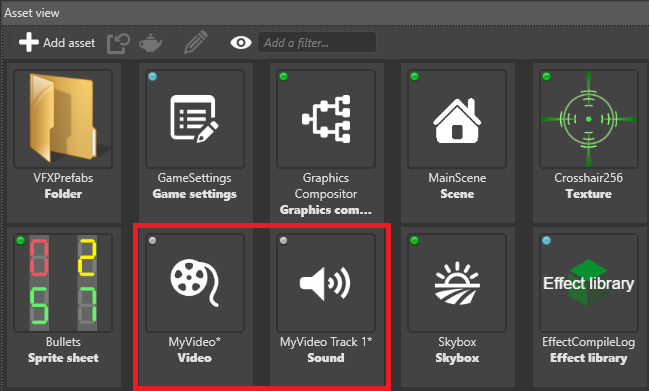 In the Property Grid, click Add component and select the video script. Xenko adds the script as a component. You can adjust public variables you define in the script in the Property Grid under the script component properties.